Most consumers do not realize the costs or the benefits of furniture reupholstery. If you have an outdated piece of furniture or just an item that needs its upholstery refreshed, there are a few things you will want to consider; most importantly, whether or not you should invest in a professional doing the job for you. If you have a well-built piece of furniture or even a vintage furniture piece, it is something that is worth investing in. From droopy seat cushions to torn fabric, these degrade the value of your furniture. While you could reupholster them yourself, if it does not hold or is done incorrectly, you will not add any value. A professional can reupholster and make your furniture look as though it came with that fabric or material, thus enhancing its appearance and of course, its value. Also, professionals can do repairs that most DIY folks cannot; such as repairing worn out springs, fixing the frame of the chair and finding quality fabric to match the piece. Speciality – Many furniture stores offer this service, but they do not specialize in it. Instead, it may be a side job they dabble in from time to time. Look for a furniture store that specializes in restoration and reupholstering furniture. That will mean they have experts on staff that can handle the job well. List What You Are Looking For – To ensure you get the job done right the first time, make sure you list what you expect from the reupholstering, what style you are trying to match or even bring in a swatch. Ask to See Finished Work – While visiting the shop, ask them about recently finished pieces and look them over yourself. If they do not have anything on the showroom floor, ask to see what is currently in progress. Ask About their Process – Check to see what process they use for their reupholstering service. Do they just remove the old cover, but not repair? Or, are they a full-service reupholsterer that can repair damaged frames, springs and fully restore your piece? Carrocel luxury furniture store can help you breathe new life into your furniture. 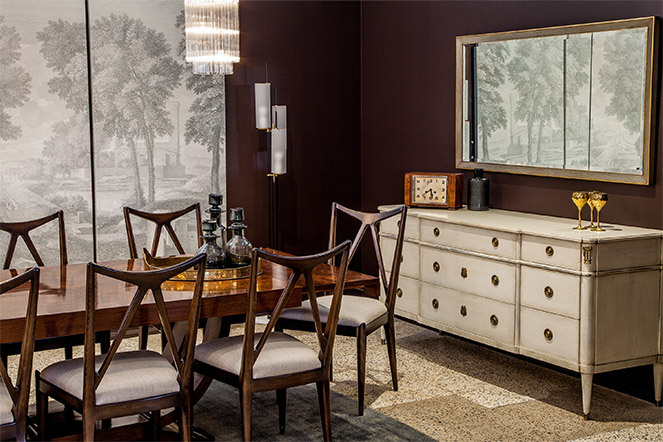 Whether you have a vintage dining room set or you just want to reupholster a unique flea market find, our professionals can help. If you need furniture reuphosltery services, contact Carrocel by dialing 416-999-2525 or visit our showroom to see samples of our recently finished reupholstered works. I have 8 dining room chairs that are upholstered in fabric (both the seats and the backs). I would like to re-upholster them in leather (both the seats and the backs). It is the chairs for the Chadwell dining set (see https://www.raymourflanigan.com/chadwell-7-pc-dining-set-699236723.aspx). Is it possible to have these chairs re-upholstered in leather (both the seats and the backs)? Hello and thank you for the inquiry. Please email info@carrocel.com with photos of your items to begin your quote process today.